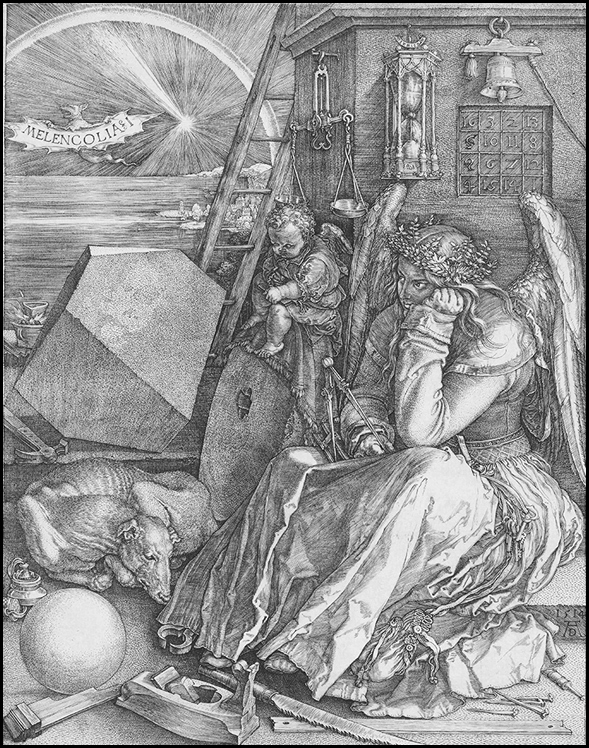 Melencolia I by Albrecht Dürer is one of the artist’s three large prints of 1513 and 1514 known as his Meisterstiche (master engravings). The other two are Knight, Death, and the Devil and Saint Jerome in His Study. In medieval philosophy each individual was thought to be dominated by one of the four temperament types: sanguine, choleric, melancholic, and phlegmatic. Melancholy, associated with black gall, was the least desirable of the four, and melancholics were considered the most likely to succumb to insanity. Renaissance thought, however, revived the Aristotelian concept that melancholics also possess the potential for creative genius. Given this precarious balance, the self-conscious artist was precautioned that his gift came with great psychological risks.